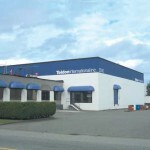 Cushman Wakefield helped broker the transaction of 3500 Viking Way in Richmond BC. The subject property is a 67,511 square foot industrial building on a 3 Acre parcel, leased out to a single tenant. The selling price of $7,300,000 represents a price per square foot of $108. The assessed value of the property for tax purposes is $6,412,000.